If you have always dreamed of performing in front of an audience, North Shore Music Theatre is a fun, friendly and safe environment to express your talent and creativity in our amateur – yet high quality – productions. Our shows are always announced on both our website and Facebook page and we advise everyone of any upcoming audition dates, plus all the info you need on auditioning for that particular production. We invite everyone to have a go, don’t worry if you don’t have any formal training or experience, community theatre is about having fun and discovering hidden talents! Have a look below for details about the different types of productions we do, plus some handy hints for when it comes time to auditioning. Club room Shows. These shows take place in our Club rooms in Birkenhead. They are usually a review or smaller scale production, and are perfect for first time performers, people re-entering the stage or backstage newbies. Pumphouse Shows. The Pumphouse in Takapuna has been our ‘home’ for several years. Most of our productions take place here as it’s the perfect size for a ‘medium’ scale shows, it’s nice and central on the North Shore and allows us to have a larger cast, set and crew. Bruce Mason/Sky City/Civic Theatre Shows. These shows are a much grander affair! With big budgets, large set pieces, huge casts and crews, our large scale productions occur every couple of years and are a whole heap of fun! Youth Shows. Generally performed in the NSMT Clubooms, youth shows are a great place for kids to burn off all that theatrical energy in an encouraging, safe environment. Schedule an audition. Most of our auditions are held over a couple of days/evenings and you are usually required to book an audition time in advance. Sometimes we may hold special workshops prior to auditions or other times we will hold call-backs to determine the best person for the role. Dress appropriately. You will most likely need to move a bit during your audition, especially if there is a dance element involved, so always wear comfortable clothing that is easy to move in. Something fitting helps show off your dance skills, but steer clear of anything to revealing or distracting. Dance shoes are ideal but not necessary, as long as your footwear is comfortable and flexible. Prepare your song, monologue, and dance. 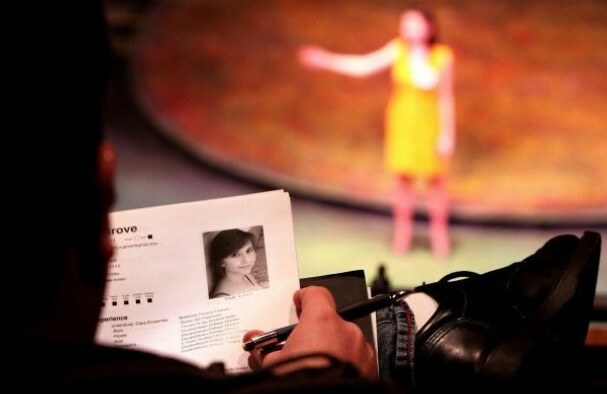 The dance and dialogue element of an audition is usually prepared for you and taught to you on the day. For your singing audition, prepare a song which suits your vocal range and has a similar style to the show you are auditioning for. Sometimes you will be required to sing a specific song from that show, and details about what format your music should be in (backing track, sheet music) will be given prior to your audition. Auditioning and meeting the team. Auditioning can be nerve-wracking, but the thing to remember is the Creative Team WANT you to be successful. Usually you will be auditioning in front of the three creative team members, a pianist and sometimes a production manager. Occasionally the dance element will be done with small groups of auditionees at the same time. Other than talent, the creative team are looking for enthusiasm, confidence and willingness to learn, so be polite, walk in with a good attitude and a friendly smile! Prepare for rejection. While this is community theatre and we try to give everybody the opportunity to take part on stage, sometimes we just have way more auditionees than roles! Don’t take it too hard if you aren’t successful in your audition, it generally doesn’t mean you did anything wrong – it just means you weren’t quite right for what the director had in mind. But we WILL remember you, and returning to audition for a future production shows us you are committed and passionate. Get involved any way you can. While many people may dream of landing the lead role, try not to turn down company/chorus positions too. The more involved you get, the more familiar you will become to everyone. You will prove you’re reliable and committed and will more likely be cast in future productions and given bigger and better roles. If you are unsuccessful in your audition, we always require production crew – it’s a really great way to get your foot in the door and stay involved.